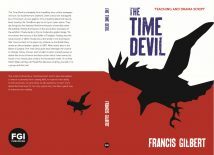 The Time Devil is a fantastic time-travelling story which teenagers will love. Six students from Deptford Green school are kidnapped by a Time Devil, an evil, gigantic time-travelling black bird having been lured by the TimeBook app he set up in cyber-space. They are flung into the National Maritime Museum where they enter the exhibits, finding themselves in the actual time and place of the exhibits. Charlie lands in Prince Frederick’s golden barge; Tai encounters the horrors of the Battle of Trafalgar; Padraig sees the Great Comet of 1843; Nicola sees a friend die in the 2nd Opium War; Favor is stuck in the great city of Benin as the British Navy storm an African leader’s palace in 1897; Miski nearly dies in the Battle of Jutland. The Time Devil gives each teenager the chance to change history forever; each student is given enough power to defeat the forces of terror and destruction which have marred so much of our history and create a more peaceful world. Or so they think? What will they do? Read this fabulous script by yourself or in a group and find out! The script is framed by a “teaching script” which gives the readers a chance to develop their reading skills; to improve their ability to skim and scan, to summarise, to ask questions, to learn more about their learning. It’s not only a great story but also a great way to improve your reading.